Henley Rowing Club entered 29 crews for Burway Small Boats Head on 28th November. All three divisions included crews from senior men, women, masters and juniors. The fastest crew on the day was the men’s quad with a time of 8mins 47 secs over the 3k course. The senior men also performed well in the singles with David Read taking the title of fastest male single sculler and wins in the IM2 and IM3 categories. 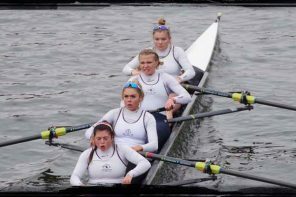 The best junior performance was the J14 girls quads placed first and second in a competitive category. 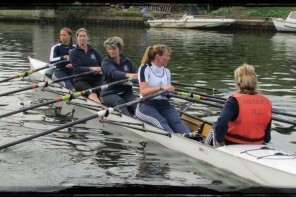 The older junior squad were competing at Wallingford the next day. Wallingford Head is 4250 meters of challenging rowing at the best of times, Saturdays strong winds made the first 1200 meters of the course from Cholsey ferry even more so. The strong tail wind created a significant swell with “white horses” making marshaling and rowing very difficult with a number of crews getting into difficulty. 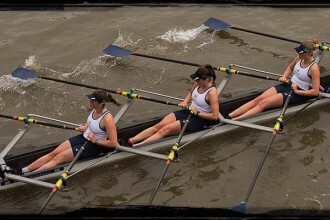 Henley’s three junior girls crews showed great skill and watermanship to come home with two wins and a second place. The WJ18 crew of Emma Lister, Lily Stimpson, Issy Jonsson, Lottie Orr, Clare Pearson, Georgia Edwards, Ella Morgan, Flo Wiggins and cox Freya Reid not only won their event but where second fastest women’s crew in the morning division despite picking up a time penalty following an incident with a Reading crew who would not let them pass. In their first eights race the WJ15 crew of Emma Gray Caoimhe O’Donohue, Amelia Crick, Jess Arlett, Sophie Hahn, Felicity Parfitt, Ruby Borg, Phoebe Fletcher, Emeline Warner, finished second behind Latymer School but where nicely ahead of major rivals Lady Eleanor Holles School who were in third place and significantly ahead (3mins) of local rival Sir William Borlase who where in fifth place. In the afternoon division the WJ16 8o Rebecca Lister, Tilly Lock, Grace Jonhson, Alice Jones, Mary Wright, Georgina Robion Ranger, Eve Poulter, Ruby Brown cox Ella Nolson, retained the J16 title in what where most probably the worst conditions of the day with an emphatic win which saw them well clear of second placed Reading RC and third place Borlase.